Law enforcement arrives Saturday outside a Safeway grocery store in Tucson, Arizona, after several people were shot. 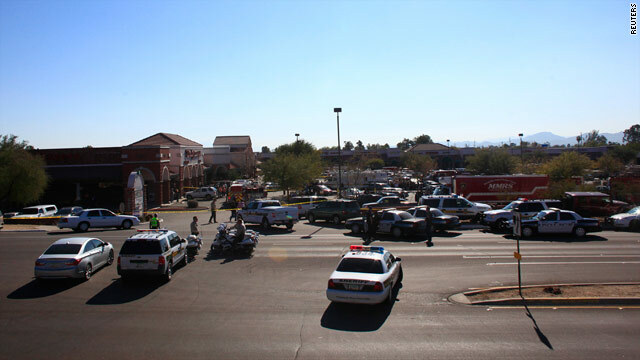 More coverage on the shootings from affiliates KOLD, KVOA, KMSB, KPHO and KGUN. [Updated at 10:30 p.m. ET] A man who helped subdue the gunman in Saturday's Arizona shooting spree said the man was trying to reload when he was tackled to the ground. "He was ready for war. He was not playing around," Joe Zamudio told CNN. "He was going to keep shooting. It was not over. He had just ran out of bullets." The gun, which another bystander had wrestled from the gunman, was empty and cocked open, and the shooter had another magazine at the ready, Zamudio said. Zamudio pinned him to the ground until police showed up. The suspect, 22-year-old Jared Lee Loughner, is in custody of the Pima County Sheriff's Office, and authorities are obtaining search warrants for a residence and his vehicle. Authorities also are seeking a person of interest but his suspected connection to the incident is unclear. Loughner is accused of shooting 18 people, including U.S. Rep. Gabrielle Giffords, a third-term Democrat who had organized the "Congress on Your Corner" meet and greet. Authorities believe the gunman had specifically targeted Giffords. She is in critical condition after undergoing surgery for a single gunshot wound to the head, but doctors said they are optimistic over her prospects for recovery. Eleven others were wounded in the shooting and six are dead, among them U.S. District Court Judge John Rolls, a friend of Giffords' who had stopped by the event to say hello after attending Mass, Pima County Sheriff Clarence Dupnik said. Also killed was ﻿Giffords staffer Gabe Zimmerman, director of community outreach who had coordinated the event to introduce Giffords to her constituents. A 9-year-old girl also was killed. The shooting sent shock waves through Washington, where Giffords was regarded as gracious and kind, a moderate Democrat known for her dedication to her constituents and willingness to work across party lines. In light of the shootings, all legislation on the House schedule for the coming week has been postponed, House Majority Leader Eric Cantor announced in a statement. Americans also struggled to come to terms with the event. Many of them showed up to a vigil at the Arizona State Capitol to pray together and share their thoughts. In the Twitterverse, theories abounded as to the gunman's motivation. Meanwhile, while speaking to the press , the sheriff lamented "the vitriolic rhetoric" in American political discourse, suggesting it played a role in the shooting. "This has not become the nice United States of America that most of us grew up in and I think its time we do the soul-searching," he said. "The anger, the hatred the bigotry that goes on in this country is getting to be outrageous and unfortunately, Arizona has become the capital. We have become the mecca of prejudice and bigotry." 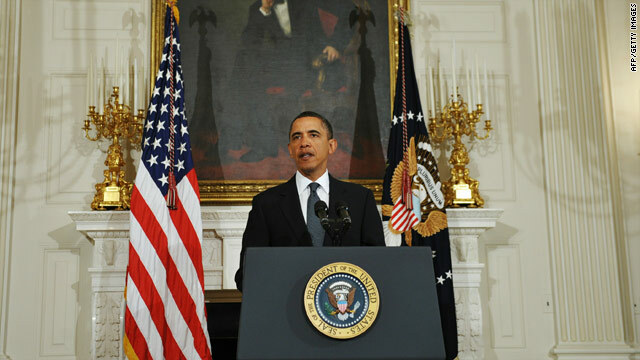 President Obama makes a statement on Saturday at the White House regarding the shooting in Arizona. "This morning, in an unspeakable tragedy, a number of Americans were shot in Tucson, Arizona, at a constituent meeting with Congresswoman Gabrielle Giffords. And while we are continuing to receive information, we know that some have passed away, and that Representative Giffords is gravely wounded. "We do not yet have all the answers. What we do know is that such a senseless and terrible act of violence has no place in a free society. I ask all Americans to join me and Michelle in keeping Representative Giffords, the victims of this tragedy, and their families in our prayers." Giffords is one of the "finest members of Congress I know." "She has spent her time in office working her heart out to improve the lives of the people she represents. She loves her husband and family above all else." "All of Arizona is shocked and deeply saddened by the horrific tragedy that transpired this morning in Tucson. "I have been in contact throughout the morning with law enforcement officials, as well as Tucson Mayor Bob Walkup, and just a short while ago I spoke personally with President Obama. The president conveyed his heartfelt sympathies for our state, and our shared determination to ensure that justice is fully served. "I am just heartbroken. Gabby is more than just a colleague, she is my friend. She has always been a noble public servant. My thoughts and prayers are with Congresswoman Giffords and her family, the Congresswoman’s staff and their families, and well as the other victims of this senseless and cruel violence." "The violence in Arizona today has senselessly taken … lives and inflicted tragic loss on dedicated public servants and their families. We in the judiciary have suffered the terrible loss of one of our own. Chief Judge John Roll was a wise jurist who selflessly served Arizona and the nation with great distinction, as attorney and judge, for more than 35 years. I express my deepest condolences to his wife Maureen and his children, as well as the other victims and their families. Chief Judge Roll's death is a somber reminder of the importance of the rule of law and the sacrifices of those who work to secure it." "Today's tragedy in Arizona was a senseless act of violence that has already resulted in devastating loss, including the death of Chief United States District Court Judge John Roll and four other individuals and the wounding of Representative Gabrielle Giffords and a number of others. All of those who were killed or injured and their families are in our thoughts and prayers. "As the President said, FBI Director Mueller is traveling to Arizona to help coordinate the investigation. The FBI is working jointly with local law enforcement to investigate today’s events, and I have directed Department prosecutors and law enforcement officials to use every resource necessary to investigate this tragedy. I want to assure the people of Arizona and every American that we will hold accountable anyone responsible for these heinous acts." "I am saddened to hear of the attack on Congresswoman Giffords and members of her staff earlier today in Tucson, Arizona. I have had an opportunity to interact with Congresswoman Giffords in her capacity as a member of the House Armed Services Committee, where she served on the Readiness and Air and Land Forces subcommittees. She is a strong supporter of America’s national defense, cares deeply about our men and women in uniform, and has pursued her oversight responsibilities with dedication. Our thoughts are also with her husband, Navy Capt. Mark Kelly, an aviator and astronaut of great distinction, as well as the families of the other victims of this attack. Ms. Giffords represents a new generation of principled and thoughtful political leaders that have come to Washington in recent years. We will miss her strong character and good judgment in the Congress during these important days ahead, and we are praying for her full recovery." "It is with the deepest sadness that we have received word of the attack on Congresswoman Gabrielle Giffords, members of her staff, and her constituents. This terrible act of violence is a national tragedy, and today is a very sad day for our country. "My prayers, and the prayers of all members of Congress, go out to her husband, Capt. Mark Kelly, their family, and to all of the staff and others who were victims of this horrible attack. "Congresswoman Giffords is a brilliant and courageous member of Congress, bringing to Washington the views of a new generation of national leaders. It is especially tragic that she was attacked as she was meeting with her constituents whom she serves with such dedication and distinction." The attacks are "devastating" and "equally devastating to every American – to everyone who cares about our democracy." "Congresswoman Giffords is a devoted and insightful public servant and a passionate advocate for her constituents-but more than that, she is my dear friend." "I am horrified by the senseless attack on Congresswoman Gabrielle Giffords and members of her staff. An attack on one who serves is an attack on all who serve. Acts and threats of violence against public officials have no place in our society. Our prayers are with Congresswoman Giffords, her staff, all who were injured, and their families. This is a sad day for our country." Reid hopes "those responsible will be brought to justice quickly." "As a representative of a neighboring state, I have watched her career closely and admired her work on behalf of the state of Arizona." "This senseless attack today in Tucson is a national tragedy, and all America mourns those who lost their lives in the very act of public service. I join the entire Congress in condemning this horrifying act of violence, and on behalf of the entire Senate family, Elaine and I extend our deepest expressions of sympathy and heartfelt prayers to Rep. Giffords and the families of those who have been killed or injured. The U.S. Capitol Police are joining local, state and federal officials in this investigation. We appreciate their quick response and stand ready to assist in their efforts." "An unthinkable tragedy occurred at our Congress On Your Corner event today in Tucson. Our community has lost beloved friends and colleagues, and many more are injured. Our hearts and prayers go out to all of them and to those who are suffering the loss of treasured friends and family members. "Congresswoman Giffords is dedicated to serving the people of Southern Arizona. It was in this spirit that our office organized today's event. We will make further statements as details become available. We offer thanks to the law enforcement, first responders, and medical personnel who work to save lives and mend the injured." "I am deeply hurt and disturbed. Some of these people were my friends. The (congresswoman) I knew very well, I worked with her for many years. The judge I knew very well, I worked with him. And so this is a very painful time for all of us. ... Our hearts are bleeding right now, for them and for their families, and for the others that were injured. This is a terrible tragedy and one, in all my years as a trauma surgeon or as a deputy sheriff, I've never seen anything like this in a community like ours." "She was responding to commands, we're optimistic." "She's a wonderful, wonderful young lady. I love her like a daughter." "It's such a shock to think that someone could want to harm such a beautiful person, inside and out. Gabby is just a treasure of Tucson and our community. She's done so much to help us, to help our economy, to help us learn how to utilize solar energy. She's pro-business, (and) I'm a Republican for Gabby Giffords, so I just love her." "We're all praying for her. She won't give up; she's a fighter. She's a wonderful woman. "I, along with, I think, all of Tucson and my state, we're all thinking and praying for Gabby right now. There are a lot of close friends and of closer family here, and we're hoping and we're praying." “I am horrified by the violent attack on Representative Gabrielle Giffords and many other innocent people by a wicked person who has no sense of justice or compassion. I pray for Gabby and the other victims, and for the repose of the souls of the dead and comfort for their families. I beg our loving Creator to spare the lives of those who are still alive, heal them in body and spirit, and return them to their loved ones. "Whoever did this, whatever their reason, they are a disgrace to Arizona, this country and the human race, and they deserve and will receive the contempt of all decent people and the strongest punishment of the law." Kyl called for "justice to be served fully and swiftly." "I find it especially saddening that such a heinous crime would occur while she was fulfilling her congressional responsibilities." "We at the Tea Party Express are shocked and saddened to hear about the terrible tragedy that took place in Tucson today. It is appalling that anyone would commit such unthinkable violence against Congresswoman Gabrielle Gifford, her staff, a sitting federal judge and the many other victims and families impacted. "These heinous crimes have no place in America, and they are especially grievous when committed against our elected officials. Spirited debate is desirable in our country, but it only should be the clash of ideas. An attack on anyone for political purposes, if that was a factor in this shooting, is an attack on the democratic process. We join with everyone in vociferously condemning it. "I join the entire House Armed Service family in my shock and sadness at the tragic shooting of Congresswoman Gabrielle Giffords. Just before the holidays, Gabby asked me to visit Fort Huachuca in her district, an example of both her bipartisan spirit and a reminder of her unwavering support for our men and women in uniform. "We offer her, her family, her staff and the victims of this heinous crime our thoughts and prayers during this difficult time." "I am deeply saddened by the senseless attack on Congresswoman Giffords, her staff and others victims of the shooting. "I have served with Congresswoman Giffords on the House Armed Services Committee for years, and she is a dear personal friend. She is an extraordinary member of Congress and an outstanding member of the House Armed Services Committee. "Her commitment to her family, our nation and our troops is unparalleled. I have never served with a more principled, dedicated member of Congress. "Her family, as well as the families of everyone involved in this tragedy, will be in my thoughts and prayers." "Our thoughts and prayers go out to Congresswoman Giffords, her staffers, others and their families. This is a horrific and senseless act, and we are all praying and sending out our thoughts for the victims today." "I am honored to count Gabby as a close friend and I know she has always fought for Arizonans and is beloved by her constituents and the people of Tucson. She is one of the brightest and best and we all know through our hopes and prayers that she will fight through this. This is a human tragedy and we are praying for all the other victims who are here with her." U.S. Sen. Charles Schumer, D-N.Y.
"Today's senseless and savage attack on Rep. Gabrielle Giffords, her staff, and her constituents is an American tragedy. Congresswoman Giffords is known throughout Tucson and our nation's capital for her kindness, her considerable intellect, and her zest for life. Rep. Giffords is a trailblazer as the youngest woman ever elected to Congress. I am praying for her healthy and speedy recovery and the recovery of all those who are fighting for their lives. My thoughts are with her husband Mark and their family and all of the families of the men and women who were abhorrently attacked today as they were exercising democracy. The individual who perpetrated these attacks must face swift and certain justice." U.S. Sen. Kirsten Gillibrand, D-N.Y.
"This hateful crime is a tragedy beyond words. I had the privilege of first getting to know Gabrielle Giffords when we served together on the House Armed Services Committee. More than just a rising political star and phenomenal talent, she is an incredible person. It is an honor to be able to call her a close personal friend. My thoughts and prayers are with all of the victims and their families." "This senseless and cowardly shooting occurred as the congresswoman and her constituents were engaged in the kind of event that makes our democracy work and represents America at its best. Anti-government sentiment carried to a violent and deadly extreme is a sad reflection of America at its worst. America is better than this." "I am shocked and devastated by the tragic events of this day. Congresswoman Gabrielle Giffords is not only a colleague but a good friend, and the Congressional Black Caucus' thoughts and prayers are with her staff and her family during this horrific time. "Even though we do not have all the answers yet, we are all too familiar with the violent and polarizing climate in which we live. There is no place in American society for such senseless and terrible acts of extreme violence. Those of us in leadership must be overly cautious of fanning the flames of extremism in hopes to prevent another horrendous tragedy such as this. "My tears are flowing, and I am stunned and angered that Gabby Giffords was savagely gunned down while performing her congressional duties. I am praying for Gabby, and my thoughts, prayers, and deepest sympathy go out to her family, as well as the families of each of the victims. "Gabby Giffords governed with integrity and wisdom. We came to Congress together and I had the privilege of knowing her as a friend and colleague. "It is my hope and expectation that the coward who carried out this horrific act of violence will be prosecuted to the fullest extent of the law. I extend my hand of friendship to her family and staff and will keep them in my prayers." "It is with profound sadness that the members of the Blue Dog Coalition received the news of this terrible act of violence against Congresswoman and fellow Blue Dog Coalition member Giffords and members of her staff. She is not only an exceptional member of Congress who has dedicated her life to serving the people of Arizona, but a true friend to all of us who have the privilege of serving with her. "Our thoughts and prayers go out to Gabby, her family and the members of her staff." "On behalf of the men and women of U.S. Immigration and Customs Enforcement (ICE), I was deeply saddened to learn of the shooting attack that gravely injured Congresswoman Gabrielle Giffords and took the life of Chief Judge John Roll earlier today in Tucson, Arizona. "Congresswoman Giffords has always been a valuable partner to ICE in our shared effort to serve the nation and we pray for her recovery. All of us at ICE condemn this senseless act of violence and join the American people in seeking justice for the victims of this horrific act." "Today's senseless act of violence is an attack on the American ideal and goes against our country's deeply held democratic values." "Arizona's Republicans are deeply saddened and mortified by the horrific shooting of Congresswoman Gabrielle Giffords and the other 11 victims at an event this morning in Tucson. "Senseless acts of violence like these are shocking, disturbing and have no place in our country. The thoughts and prayers of all Arizonans are with the victims and families during this terrible tragedy in our state's history. We sincerely hope that the responsible party is prosecuted to the fullest extent of the law." "My sincere condolences are offered to the family of Rep. Gabrielle Giffords and the other victims of today's tragic shooting in Arizona. "On behalf of Todd and my family, we all pray for the victims and their families, and for peace and justice. "I am deeply saddened by reports that Congresswoman Gabrielle Giffords, Chief Judge John Roll and others were attacked this afternoon in Tucson, Arizona. There is no place in our society or discourse for such senseless and unconscionable acts of violence. Gabby is a steadfast representative for southern Arizona and both she and John are dedicated public servants. "The Department of Homeland Security has offered all possible assistance to the FBI and the Pima County Sheriff’s Office, who are leading the investigation. My thoughts and prayers are with Congresswoman Giffords, her family and staff, and all those who were injured in this difficult time." "Please join us in praying for Congresswoman Gabrielle Giffords and everyone shot in this tragic attack, as well as for their families." "Please join Janet and me in praying for Congresswoman Gabrielle Giffords and all the victims of the tragic shooting in Arizona." "Today's horrifying shooting in Tucson shocks the conscience of decent Americans everywhere." "What occurred today in Arizona is a senseless and horrific tragedy. Gabby is a friend, a former colleague, and a respected public servant who was doing what she loved most: meeting her constituents. She will be in Amy and my thoughts and prayers as she fights for her life, as will all of the victims." He called on churches to pray for the congresswoman and the families of those who were wounded or killed. "In church services tomorrow, clergymen ought to address the senseless violence that has too often raised its head of late in the social and political discourse of this country." 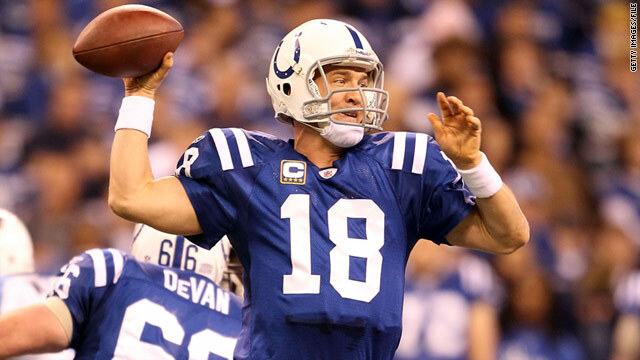 Indianapolis Colts quarterback Peyton Manning lead's the league in potential endorsement impact, Nielsen reports. As Peyton Manning and the Indianapolis Colts prepare to take on the New York Jets Saturday in the NFL playoffs, the MVP quarterback has already scored a victory of sorts. Manning is No. 1 in marketability, according to Nielsen, which evaluated the "N-scores" of top playoff signal callers in conjunction with E-Poll Market Research, a consumer research firm. "N-Score gauges the effects of positive and negative news about athletes and sports personalities," the report said. Manning, who guided his team to a Super Bowl victory in 2007 and came within an errant pass short last year, rates the highest in a number of measurable categories related to brand impact, Nielsen said. He has a N-Score of 262. As a four-time league MVP, Manning has a varied endorsement portfolio and has been featured in numerous, often humorous, television ad spots for top brands. New Orleans Saints quarterback Drew Brees, who also plays Saturday, came in second place with an N-Score of 166. New England Patriots quarterback Tom Brady came in third with a tally of 131. “The N-Score is derived from a model that factors in audience awareness of an athlete, the overall appeal of the athlete and 46 specific personal attributes such as leadership and trustworthiness,” Nielsen’s report said. Philadelphia Eagles quarterback Mike Vick had a score of just 16, attributable to “lingering public displeasure with his conviction on dog fighting charges,” the report said. 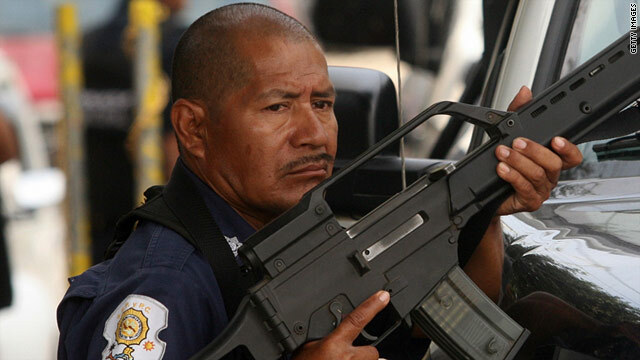 A police officer takes position in Acapulco, Mexico. Security spokesman told CNN on Saturday.